A decade ago, computers were nothing more than an ancillary support in our day-to-day tasks. Now, computers and the Internet have upturned our lives and made it easy. However, advanced technologies like IoT and other smart devices handle a lot of critical data and thus face threat from cyber attackers. They continue to develop tactics to crack your cyber security. Additionally, hacking incidents (cyber attacks like ransomware and many more) from the past year indicate that the upcoming year is strongly focused on latest trends in cyber-security. Hence, we at the beginning of the new year bring before you some cyber-security trends that will certainly happen in 2019. 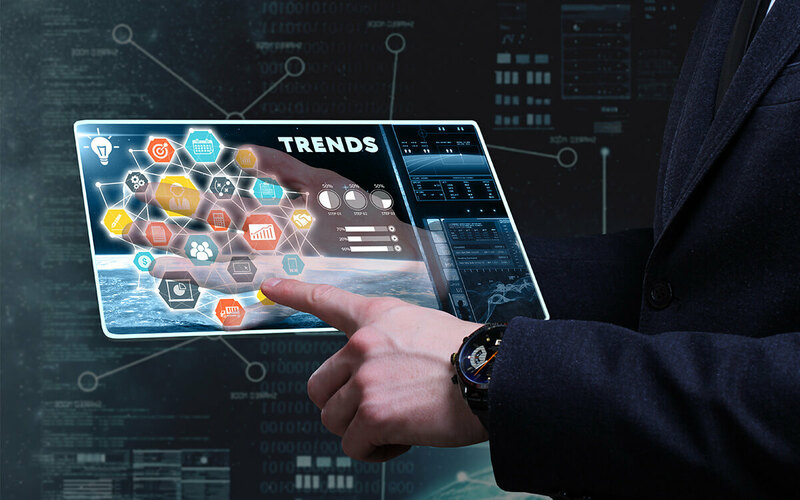 Here are our top 6 IT security trends for 2019. OT or Operational Technology is rapidly adopting IoT to automate processes. But, IoT devices lack security features and therefore invite various cyber risks. As IoT products nowadays have begun to handle much critical user data, IoT manufacturers are focusing on Deception Technology to enhance IoT security system. It is the one latest cyber security trends 2019. Deception technology is a security technique which enables companies to stop cyber criminals who have already invaded the network. The technique generates several fake credentials to trick the attacker to use any of those credentials. As soon as the attacker uses the fake credential, the defense system alerts cyber experts that an intrusion has been performed. Thus, security experts can take immediate actions to stop damage. Furthermore, the mechanism also reveals the pattern of the attack and educates how attackers gained control over the system. Most IoT manufacturers who previously didn’t care much to include cyber security features while developing IoT devices, will now introduce techniques to make IoT devices secure enough for users. Hence, in 2019, you will see many IoT products with latest cyber security features. Application will become smarter, thanks to artificial intelligence (AI) and deep learning. Deep learning will help applications to learn by itself. It will empower them learn the smallest user behavior and even develop their own language to communicate with each other. Website applications will learn user behavior and judge whether a real person is performing the action or not. Hence, bot attacks can reduced to a bigger extent providing enhanced security to user data. Thus, security vendors take the help of deep learning and machine learning to detect and remove threats. Moreover, companies will focus on real-time detection rather than their prevention. Threats should be detected and removed quickly to prevent damage of user data and the device. Therefore, machine learning will add to the latest cyber security trends for empowering antimalware tools against cyber threats in 2019. Your protection programs may use machine learning for smarter and quicker response against various cyber-attacks. There will be tools that will communicate with devices to allow quicker resolution of security problems. As cloud services are advancing and more users are accepting the technology, service providers will focus more on cloud security especially SaaS and IaaS platforms. The platforms will incorporate improved security features in 2019. Moreover, companies will ensure that measures are taken to prevent insider attacks in the cloud industry. Tools that detect intrusion inside cloud will be a new cyber security trend in 2019 and experience stronger demand this new year. One of the latest trends in cyber security is application becoming smarter, thanks to artificial intelligence (AI) and deep learning. Deep learning will help applications to learn by itself. It will empower them, learn the smallest user behavior and even develop their own language to communicate with each other. Website applications will learn user behavior and judge whether a real person is performing the action or not. Hence, bot attacks can be reduced to a bigger extent providing enhanced security to user data. Therefore, they learn from the user behavior and remove threats like compromised devices or bad packets. Many organizations have already set their path to induce threat hunting applications in their defense systems. A decade ago, IT teams in the organizations stopped users from using devices that were not provided by the organization. The policy is named as “Zero Trust” policy. However, Zero Trust policy might be re-introduced as a cyber security trend in 2019 as a result of rise in cyber-attacks in many organizations. Though the policy may not be too rigid like its predecessor, it will empower IT teams to enforce certain steps for better cyber security. There will be severe authentication measures to verify identities of the users. It will verify whether the user has access to particular sets of data and then validate the user to use the data. Organizations may implement a cloud-based authentication system for quick authentication and verification. Blockchain is an emerging technology and it has got a lot to offer. The technology can help in improving cybersecurity around identity authentication and management. Blockchain is a transparent technology and thus its feature will be used to strengthen security. Companies will implement Blockchain to make their transactions more visible within the organization. Hence, the Blockchain administrator who monitors all transactions can discontinue a transaction as soon as he finds it suspicious. Again, organizations can implement “zero trust” policy with the help of Blockchain. The technology can also be used in forensic investigations. Other utilizations of Blockchain will come out in 2019. Products will be smarter and more secure than ever due to latest trends in cyber security. When it comes to cybersecurity, things could be quite complex but are necessary. Hence, a better and sophisticated approach to counter ever-evolving cyber-attacks will only save your data and could eliminate overheads for users to some extent. Hope this article fulfills its aim to keep you more updated about the latest IT trends in cybersecurity. Connect with us in the comments below. Want to stay updated about latest tech trends, subscribe to our Newsletter now.